When Epcot opened, it had the same two sections we know today: Future World and the World Showcase. Epcot opened on October 24, 1982, and was dedicated by E. Cardon Walker, the CEO of Walt Disney. Future World was to display concepts of the future to guests, showcase new technology, and celebrate the power of brainpower. The original goal was for companies to sponsor different pavilions. As Epcot grew older, companies stopped renewing their contracts and many pavilions since have been left without sponsors. Epcot was thought of as a permanent World’s Fair, each pavilion was supposed to have a variety of attractions to entertain guests. 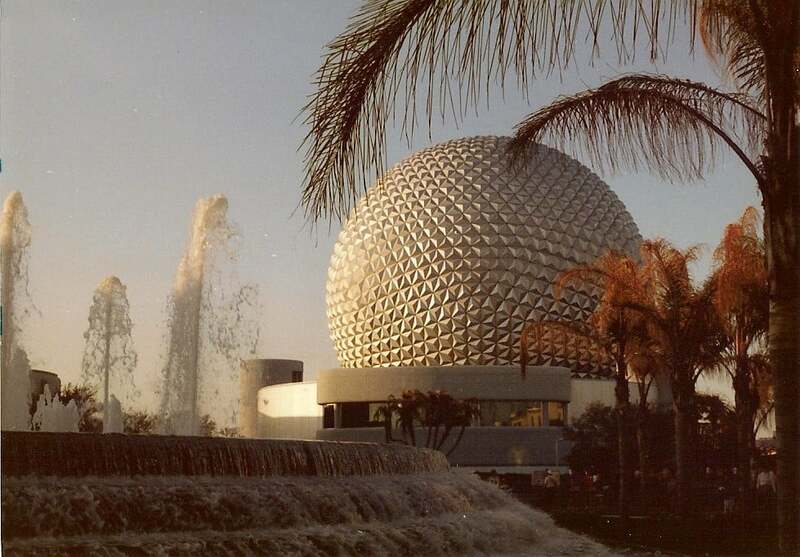 Jack Linquist, the senior vice president in 1982, said ” “One of the things that will mark EPCOT Center as adult-oriented is that it will be more complicated and take longer to absorb than anything at Disneyland and Walt Disney World. The Land Pavilion might take up to four hours to work one’s way through it.” Originally, the pavilions had multiple attractions (not rides) to visit, and guests could spend hours in each. As time passed on, this became less and less possible. Epcot was called EPCOT Center until 1994. The “EPCOT” was capitalized because it is an acronym for Experimental Prototype Community of Tomorrow, and acronyms were meant to be capitalized. In 1994, the name was changed to Epcot ’94, and in 95 it was changed to Epcot ’95. From 1996 to today, Epcot is simply called “Epcot”. (There have been rumors of a name change to Epcot World Center, but these are unconfirmed and hopefully not happening). Each of the original pavilions had a logo, which was used widely across advertisements, Epcot, and in the rides. These logos are no longer used today. Spaceship Earth is located inside of the geodesic sphere at the front entrance of the park. The theme of this attraction is actually communication, which may surprise you to hear at first. But, think about it. The attraction is all about how humans first learned to communicate with each other using words and symbols. Then, you learn about how records were kept using books, and how the printing press was created. Later you see when computers were made, and how that technology progressed. Spaceship Earth Pavilion, 1985. Courtesy of Disney Tourist Blog. The attraction was originally sponsored by Belle/AT&T (fitting for the communication theme), but was later sponsored by Siemens. This sponsorship ended in 2017. Spaceship Earth is one of the most classic attractions at all of Epcot and is the symbol of the park. This pavilion may not be familiar to you. Communicore was later rebranded as Innoventions! Communicore had a similar concept: it had changing exhibits on technology sponsored by private companies. The official theme was innovation. The pavilion originally had a focus on educating guests about computers. A feature exhibit was a tour through EPCOT Computer Central which was the computer hub of Epcot that ran almost everything in the park. Communicore was branded as the “Main Street of ideas and innoventions”. Similar to Main Street U.S.A. in Magic Kingdom, Communicore was the entrance to Epcot and set the stage for the park. There was a planned exhibit that would use the second floor to house a PeopleMover that would allow riders to see all of the attractions in Communicore. In 1994, Communicore was rebranded as Innoventions but remained focused on educating guests about new technology and science. This pavilion featured [ 🙁 ] a moving theater that could take eighty people through the pavilion. Originally, the attraction was sponsored by Exxon. Originally, Exxon wanted the pavilion to focus primarily on fossil fuels, however Disney worked out a balance between fossil fuels and renewable energy. In 1989, the pavilion closed to remove the preshow film that referenced an Exxon tanker after a huge oil spill. The official theme of the pavilion was energy. 1982 Universe of Energy Pavilion. Courtesy of Mickey Wiki. In 1996, Disney revamped the attraction and named it Ellen’s Energy Crisis, later changing that name to Ellen’s Energy Adventure. Ellen DeGeneres was the narrator and star of the story. Exxon dropped its sponsorship in 2004. Sadly, this pavilion is yet another classic Epcot pavilion that has been lost. This attraction took you through the ages of dinosaurs and taught guests about energy including solar power, fossil fuels, wind power, and more. Bill Nye the Science Guy also made an appearance. In 1996, it was closed and replaced by Test Track. Test Track took guests through the “vehicle testing process”. In 2012, it was revamped and is now sponsored by Chevrolet, a division of GM. The building for both transportation pavilions remained the same, and is meant to look like a wheel from an airplane view! This pavilion was developed and sponsored by Kraft, and later switched sponsorship to Nestle. It was meant to represent the development of agriculture and food technology. It housed several attractions and restaurants. Symbiosis was a twenty minute film that explored technological progress in the environment between people and the land. In 1995 it was replaced with Circle of Life: An Environmental Fable which featured characters from the Lion King. This attraction closed in 2018. Kitchen Kabaret, later replaced with Food Rocks, was an audio-animatronics stage show. Many fondly remember the Kitchen Kabaret by the song “Veggie Veggie Fruit Fruit”. In 1992, Nestle took over sponsorship of the pavilion and its three attractions were revamped. In 2004, Food Rocks was demolished to make way for the new ride Soarin’. Listen to the Land was a narrated boat ride that sailed through different environments and food growing areas. The ride was narrated by a Cast Member at the head of the boat, and a popular song “Listen to the Land” was heard here. The original names of the greenhouses were Tropics House, Aquacell, Desert House, Production House, and Creative House. In 1983 the ride was renamed to Living with the Land, which kept live narrators until 2008. The revolving restaurant is original to the Land Pavilion, but has changed names various times. It opened as the Good Turn Restaurant until 1986, was renamed Land Grille Room until 1993, and has been Garden Grille since then. Much of the food served here comes from the greenhouse in the pavilion. Pavilions 6-9 on the next page! You forgot to mention the “Making of Me“ movie that was shown in the wonders of life pavilion. That was a great one! There were so many great attractions in that pavilion, we could write a whole article just about it!